Soaperstar: Two new Soaperstar soaps - introducing Twilight Haze & Good as Gold!! Two new Soaperstar soaps - introducing Twilight Haze & Good as Gold!! Yesterday I decided to make two new Soaperstar soaps and here they are! The one pictured on the left is a modern, understated style soap and is called Twilight Haze. 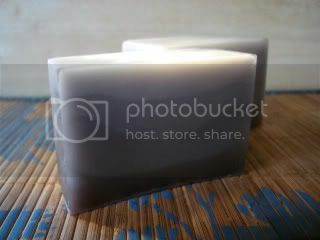 It is made with a two clear SLS free soaps (which are not crystal clear); one coloured with two different types of dark purple/red mica (a naturally occuring mineral used for cosmetic purposes) which produced the darker purple colour - the other soap was a light purple colour and the final soap in the blend is goatsmilk which adds a high degree of moisturisation for your skin. 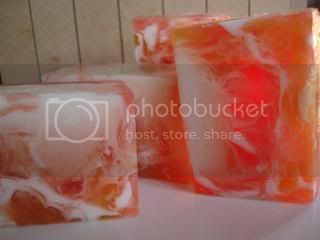 It is fragranced with a unisex fragrance blend of pomegranates, raspberries, plums & pink peppercorns on a base of frankincense, patchouli & dark spicy woods - dark, spicy and wonderfully fragrant which was designed as a unisex soap. The soap pictured on the right is our Good as Gold soap and is a fabulous blend again of two clear soaps - one coloured orange and one coloured yellow but with two different gold micas added giving a fabulous golden hue, the final soap is a goatsmilk base which is so moisturisig to your skin (gentle enough for use on your face). This is fragranced with a blend of sweet floral nectarines & juicy mandarins complimented by peach & plum on a creamy vanilla base - and I am not kidding you, it is AMAZING! I just love it, so fragrant and, if a smell can be juicy, it's juicyyyyyyy!! Both soaps lather fantastically well and, with the added Apricot Kernel Oil and added moisturising factors, they really are a luxury treat for your skin. So, if you like the modern, understated elegance of our Twilight Haze Soap or the bright, glittering juicyness of our Good as Gold soap, you will not lose out! Both of these soaps will be sold via our new online soap which I hope to open in the next few weeks! As ever, if you like these soaps, please feel free to leave me a comment - I really hope you enjoy them as much as I enjoyed making them. Absolutely wonderful. I am 'partial' to "Good as Gold" :+} - Keep up the great creativity. Thanks so much Hilary, I really appreciate it - you should smell that soap it, it's divine! Fruity and juicy, so so so good!! wow your soap is getting more and more amazing...when can we buy some?? web site needed please....!! Thanks Michaela! I'm hoping to be ready for November but it's quite dependent on funding I'm afraid... as you know all about!! !